What comes to mind when you hear the name “muay Thai”? Despite its reputation for ferocity, the muay Thai practiced at Ran Lee Muay­thai Gym in Kao­hsiung is nowhere near as brutal as what you’ve seen in the movies. In fact, even people with high blood pressure can take part! Gym leader Ran Lee studied orthodox muay Thai in Myan­mar and Thailand. As the art began to grow in popularity inter­nation­ally, Lee brought it to Taiwan, earning him the title of “father of muay Thai in Taiwan.” He has taught muay Thai for over 17 years now, and among his many students in that time he can count even a bodyguard of an ROC president. Lee’s students have also put in excellent showings at both muay Thai and ­sanda (Chinese kickboxing) events at home and abroad, building quite a reputation for their art. Stepping into Ran Lee Muay­thai Gym, I am immediately struck by the smell of lini­ment that fills the air. Gym leader Ran Lee sits on the floor repairing protective gear for his students as the afternoon sun pours in. It is a peaceful scene quite at odds with most ­people’s impressions of muay Thai. In comparison with other combat sports like boxing or ­sanda, there are fewer rules in competitive muay Thai. Punches, kicks, knees, and elbows can all be used at extremely close range, which means the fighters’ blows remain incredibly power­ful and the chance of drawing blood is high, contributing to the general perception of muay Thai as a brutal art. The modern, ring-based form began to gain popularity worldwide in the 1960s. However, relatively few people in Taiwan engaged with the sport, so Ran Lee began by putting muay Thai techniques to use in boxing matches. 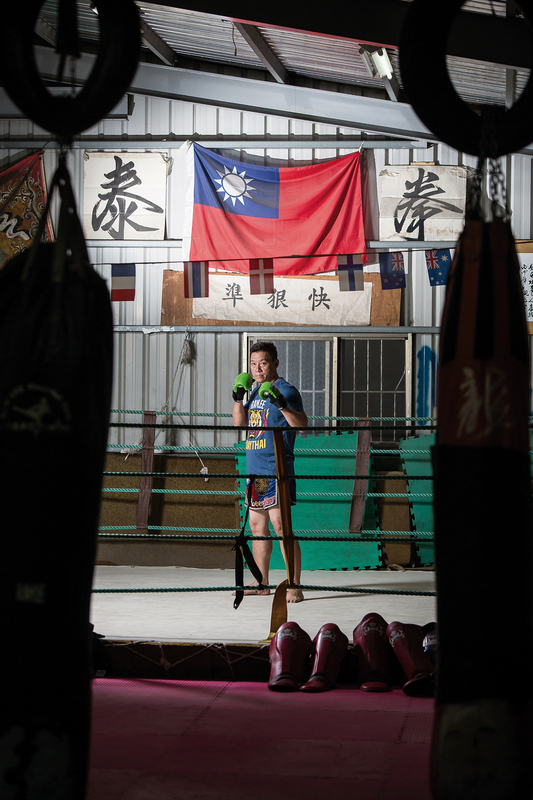 It was this that earned him recognition as the founding father of Taiwanese muay Thai. At age ten, the Myanmar-born Lee began studying Chinese kung fu and lethwei (Burmese kickboxing), only switching to muay Thai after he moved to Taiwan, where he saw a piece on the National Geographic Channel about muay Thai legend Apidej Sit-Hirun of Thailand. Sit-Hirun racked up an impressive 340 career wins and at one point held a total of seven muay Thai and boxing titles at the same time. To this day, no one in the muay Thai world has been able to match Sit-Hirun’s achievements. Lee was immediately drawn to Sit-Hirun and jumped on a flight to Thailand to ask the champion to take him on as a student. His training in Thailand saw him spend ten hours in intense muay Thai training each day. It was almost too much to physically bear. “The hardest part was getting over injuries. If I injured my shin, for example, then I had to take it as a sign I hadn’t toughened that area up enough, so I had to train harder,” says Lee about that time. To the Thai people, muay Thai can be a profession, while most Taiwanese study it as a form of exercise or to get in shape, and so their approach to it is vastly different from the Thai approach. That said, there is one big advantage to learning muay Thai in Taiwan—with Taiwan being comparatively more affluent and having a national health insurance system, there are better healthcare options open to oft-injured fighters. “You don’t have to worry about the medical side; you can just focus on training and becoming a champion,” says Lee. Ran Lee Muay­thai Gym focuses on fist- and footwork. “Clinches are the essence of muay Thai,” says Lee, “and fist­work and footwork are the fundamental techniques.” If your footwork is solid, then your punches will be too. Some 70% of our muscles are in the lower body, and by strengthening the thighs through legwork, you can not only improve circulation but also develop the physical strength muay Thai demands. Once the foundations are laid, Lee then works with students one on one, because only by wielding the pads himself can he really tailor the training to the student. “Coach teaches us to be ethical and filial.” Another of Lee’s students, Chiu Ting-chu, has been studying with Lee for many years and describes him as someone worthy of learning from in terms of how he interacts with people and deals with situations as well as in muay Thai. Lee works with a wide variety of people, with students from over 20 countries whose professions include judges, professional military personnel, and police officers. “Muay Thai emphasizes practicality and must be tested in combat,” says Lee. Studying in isolation can never create true improvement of skills or mentality—only by challenging yourself in actual competition can you really grow. Lee frequently encourages his students to compete. “The more you fight, the better you know yourself and the more humble you get, because you realize you don’t actually know all that much,” says student Ann Hou. Seeing how nimble the 28-year-old Hou is, it’s hard to imagine that when she first joined the gym she weighed 85 kilos, yet the coach asked straight out if she wanted to compete. Over the next year and change, she spared no effort to get to her fighting weight, 57 kg. “The hardest part of competing, I would say, is cutting weight. I see everyone pigging out and I’m stuck just drinking water,” says Hou. However, once she stepped into the ring, all those worries were behind her, and the hard work proved to be all worth it when she stepped out a winner. Another of Lee’s students, Luo Qi­rong, made it to the final match of the 2012 Hong Kong Supreme Fight Championship, ultimately being defeated by HK fighter Chan Kai Tik for the Asian Gold Belt. Chan was a world amateur muay Thai champion, and was technically superior to Luo, “But Luo kept at it the whole way through and was an even match for him,” says Lee in praise of Luo’s impressive achievement. Competitive muay Thai fights go five rounds, with the last one deciding the winner. Even if you lose all four of the previous ones, if you can take that fifth round, you win. This setup is a display of the spirit of muay Thai: perseverance. As Lee says, you don’t know the final score until the end. New student ­Chuang Fu-jen admits that “the training is really grueling; even just doing the stretches makes me want to cry.” ­Chuang suffers from high blood pressure and took up muay Thai for his health. In just four months he has been able to get his condition under control, and his doctor even gave permission for him to cut down on his medication. Studying muay Thai is about training your willpower, and that is then reflected in both life and work. If you can make it through the pain of training, what can’t you make it through? How muay Thai is promoted is something that has been changing with the times. Lee is now often invited to gyms to give demonstrations; to orphanages to show his ram muay, the traditional “dance” performed before fights in honor of the fighter’s teacher; and to college muay Thai clubs as a consultant, helping more and more people get familiar with the sport. 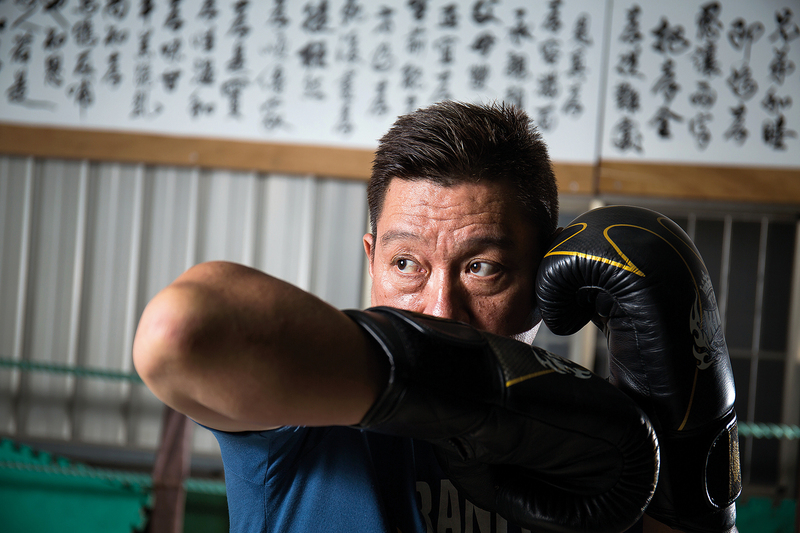 Even now that he has settled in Kao­hsiung and is raising a family, Ran Lee’s life is still focused on muay Thai education. Every night as class gets under way, the scent of the students’ sweat replaces the smell of liniment that otherwise pervades the gym. Even when the pain of yesterday’s practice is still fresh, Lee pushes on, realizing the spirit of muay Thai: perseverance, to the very end!